The baby bangs, a rosy pout, flush cheeks, and a melancholy, beautiful smile. 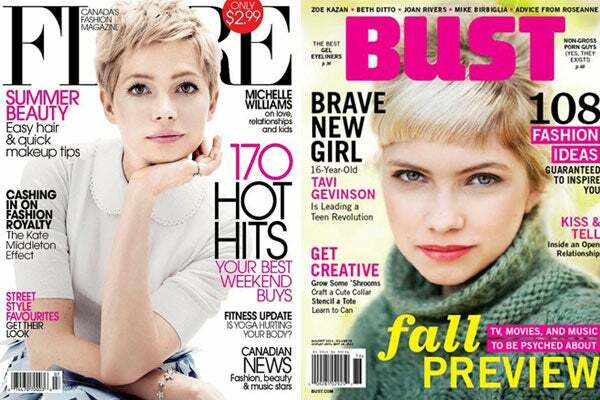 That describes Michelle Williams to a T. Except this cover of Bust, a rad feminist mag, isn't Michelle at all, but fashion's own Tavi Gevinson. When we brushed past this cover, we did a double, triple, and quadruple take — the young blogger is beginning to look an awful lot like Miss Williams, too. This forces us to face a couple of hard truths: One, Tavi is growing up. No longer is she that gawky tween who is nervously sitting in the front row of fashion shows — she's a full-blown woman. Secondly, and this is something that we've known for a while (but we are finally vocalizing it), but Tavi isn't just cooler than us when we were her age ... she's cooler than us, period. Check out this shoot. Bust is known for picking up the post-Jane, post-post-Sassy alternative ladies' magazine (a DNA that, ahem, R29 shares too), and they asked Tavi some pretty amazing questions about the superficiality of fashion, her disillusionment with the fashion world, and her future plans. But the shoot itself is Tavi to the bone, showing her in '50s-styled '90s wear. There is nothing glamorous or scandalous — just the Oak Park native hanging out in a yard, looking natural, put-together, and unafraid to break rank. Sounds like another star who hit fame at a young age, right? Maybe she and Michelle have more in common than just immaculate peaches-and-cream skin.